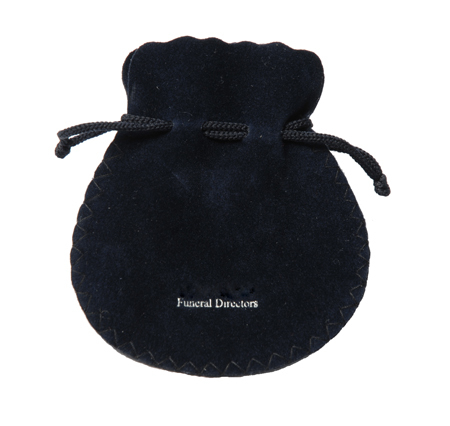 High quality 100% cotton velvet ash casket bag with a drawstring cord around the collar. 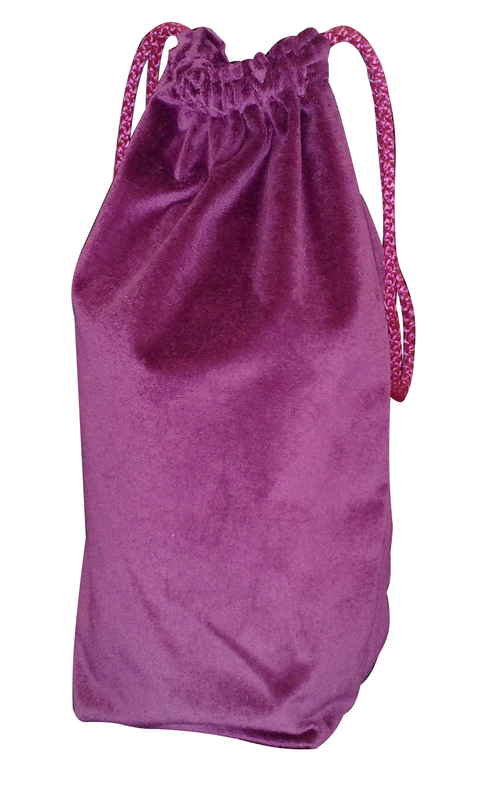 Available in Maroon, Navy, Green & Purple. Dimensions: 560mm x 380mm x 255mm. Special Offer prices on 100+ units in Navy or Maroon. 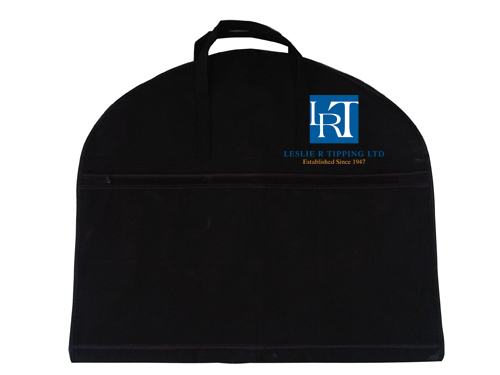 Embroidered option also available - please contact us for more details. 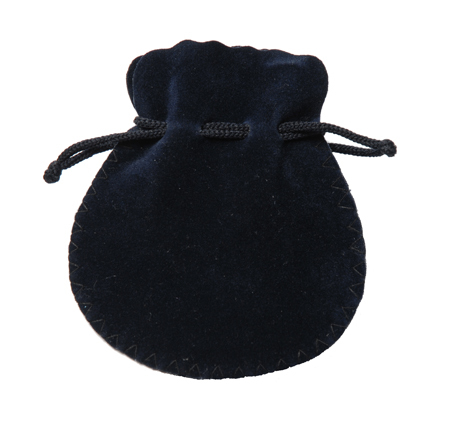 High quality 100% cotton velvet poly urn bag with drawstring around the collar. Dimensions: 370mm x 265mm x 130mm. Available in Green, Maroon, Navy and Purple. 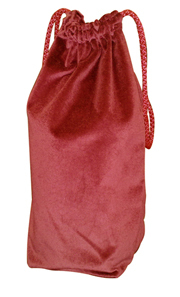 Special Offer prices on 100+ units in Navy or Maroon. Personalisation also available - please contact us for more details. When funeral arrangements are made, quite often the family decide that their loved one should be dressed in their own clothes. 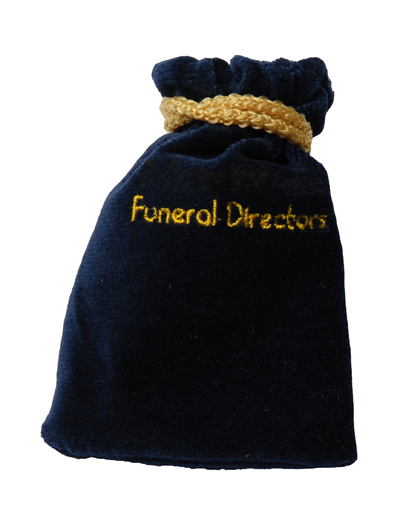 Providing them with a cost effective branded clothing bag/carrying case so that the family can return the deceased's clothing in a presentable manner can only add to the professional service being provided. These Style 1 carriers feature a metal grommet for easy carrying, a reinforced hanger opening and an oval window for personal details. They are manufactured in 0.07mm PVC, 3 gauge. Size: 1020mm x 610mm. Priced each with a minimum order of 100 and in 3 price brackets (100+, 200+ and 500+). Price includes up to 2 colour printing of your company name/logo/message in a print area of up to 200mm x 200mm. Available in the following colours: Black with Gold binding, Black/Black, Black/Silver, Green/Gold, Navy/Navy, Maroon/Maroon, Silver/Silver. 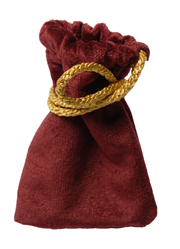 Carriers are also available individually bagged - see option menu to select this option. A one off screen set-up charge of £25.00 will also be applied to your order. When we receive your online order we will contact you to obtain your colour choice and your personalisation requirements. 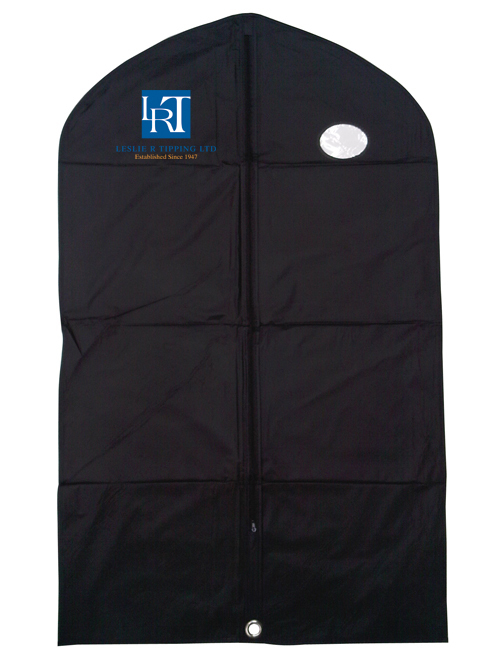 These Style 2 carriers feature a diagonal zip, a reinforced hanger opening and a window and business card holder. They are manufactured in 0.12mm PVC, 5 gauge. Size: 1020mm x 610mm. Available in the following colours: Black with Gold binding, Green/Gold, Navy/Navy, Maroon/Gold and Silver/Black. 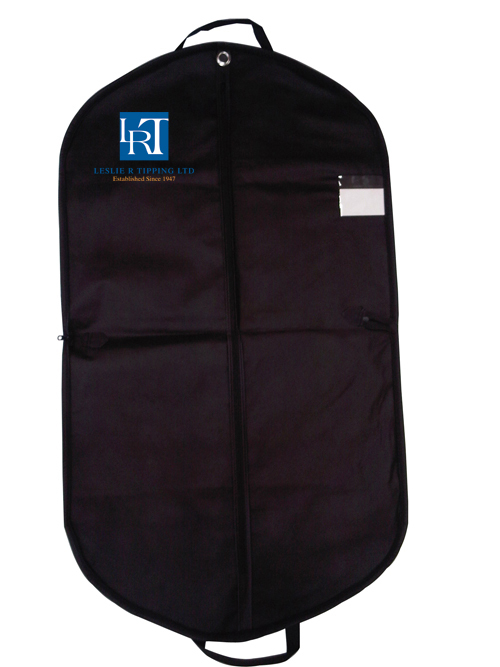 These Style 3 carriers feature a vertical zip, a reinforced hanger opening and a window and business card holder. They also have the additional benefits of having handles, a shoe bag and an additional perimetre zip to maintain a folded position. 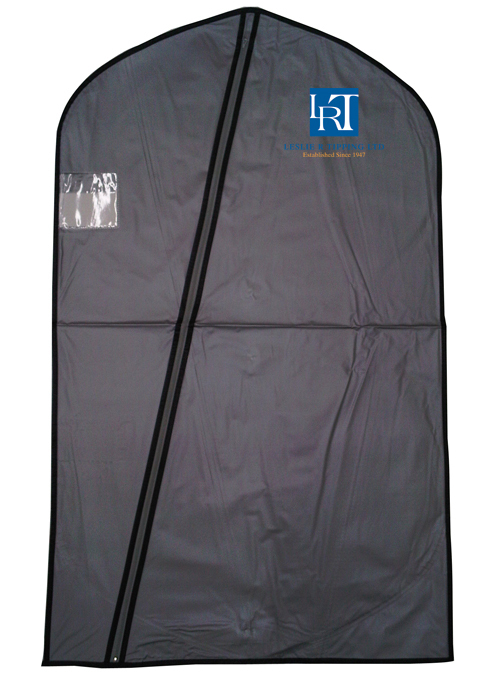 They are manufactured in 0.12mm PVC (outer) with a non woven polyprop inner. Size: 1120mm x 610mm. Priced each with a minimum order of 100 and in 3 price brackets (100+, 200+ and 500+). Price includes up to 2 colour printing of your company name/logo/message in a print area of up to 200mm x 200mm on both sides of the carrier. Available in the following colours: Black, Green/Gold, Navy/Navy and Dark Grey. Coloured plastic ring box with lift off lid. 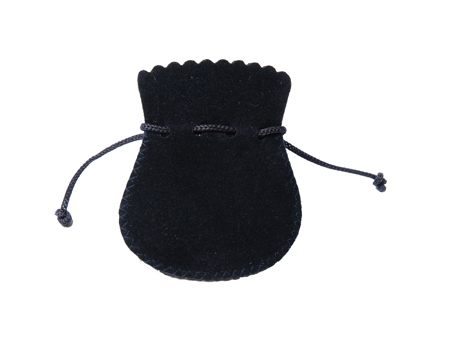 Includes a lining of soft wool pads. Dimensions: 40mm x 40mm x 16mm. Sold individually. This product is available in 2 colours - ivory or black. Ring boxes can be personalised on the lid - you can order these here (minimum order for personalisation of 100 applies). Once we receive your order for personalisation we will contact you to obtain your specific requirements. Velour pouch suitable for items of jewellery. Sold individually and available in small and large and either Navy or Burgundy in colour. Dimensions: 80mm x 65mm (small), 110mm x 110mm (large). Special Offer prices available on 100+ units. Pouches can also be personalised - you can order these here (minimum order for personalisation of 100 applies). Once we receive your order for personalisation we will contact you to obtain your specific requirements. 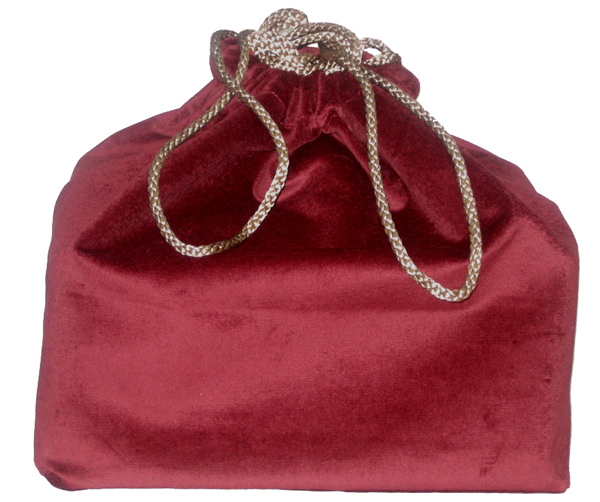 High quality 100% cotton velvet jewellery bag with a gold drawstring cord around the collar. Special Offer prices for 100+ units in Navy and Maroon. Embroidered option available - please contact us for more details.